Koi Fish Meaning: Living Jewels and Dragons! The koi fish is one of the most striking symbols found in both Japanese and Chinese culture and history. These animals, favorites of aquarium and koi pond enthusiasts around the world, have a rich history and deep symbolic meaning. So what is the meaning of the koi fish? This article looks at koi fish meaning, symbolism, and history. It also discusses the modern koi that has now spread throughout the world. The koi is universally a symbol of strength, perseverance, love, bravery, and dedication — whether that be found in Chinese or Japanese myth, in art, feng-shui, or even in tattoo art. Let’s swim into the details! 0.1 What is the Koi Fish? What is the Koi Fish? The koi fish is a type of fresh-water carp that has been bred to have various beautiful color patterns and brocades (shimmering scales). These fish are kept in koi ponds or aquariums for symbolic, feng-shui, and decorative purposes. Sometimes called “living jewels”, the koi fish has become a famous symbol of beauty, love, and prosperity throughout the world. The word “koi” is the Japanese word for carp. The word koi would be used to describe both the brightly colored, adorned fish commonly described as koi, and the more typical muted colors of the classic carp. Consequently, when the word Koi is used in Japanese, it may refer to both the wild carp found throughout the country and the colorful aquaculture carp, which is known as Koi in the west. In Japanese, the word “koi” is a homophone for the word “love” or “care”, and are associated with friendship and love in Japanese culture. However, many Japanese would call the colorful brocaded fish that westerners call koi fish Nishikigoi; the word koi is used to refer to the carp in general. The koi carp is a fish native to central Europe and Asia, where it was bred for centuries to be used as a food source. The fish is quite hardy and cold-water tolerant, which made it an ideal candidate for breeding. There are records of the koi being used as a food source as far back as the 5th century BC in China. The koi carp spread throughout Asia, including to Japan, where its hardiness made it a favorite choice in areas where the weather gets cold. There, it became a favorite animal. The koi was bred for food, and was an excellent oily fat source that was an ideal supplement to the starch-heavy rice-focused diet in the northern Japanese island of Honshu. The presence of koi ponds on Japanese rice farms didn’t really require additional land to be devoted to these animals: the rice farmers grew the carp in the ponds that they would then use to flood the rice paddies. While there were undoubtedly color variations among the carp that were bred for food purposes throughout central and east Asia, it wasn’t until the early 1800s that the more striking color patterns now known among koi enthusiasts began to propagate. In Japan in the early 1800s, farmers began to target specific color variations with their breeding techniques, creating the shimmering, brocaded color palettes of gold, red, blue, green, yellow, and black that are loved today. In 1914, Japanese Emperor Hirohito added koi to the Imperial Moat to much fanfare throughout the country. Japan went wild over the fish, and its popularity increased significantly throughout the country. When these fish were exhibited at an exposition in Tokyo in 1920, they became a sensation and demand for these colored carp took off. Japanese Zen gardens became associated with koi ponds, and the popularity of these tranquil yet powerful fish spread throughout the world. Though the major color variations were all established in the 1800s, koi enthusiasts and breeders have further expanded the types of koi available. The major “standard” classifications of koi types are all of Japanese identification. These standard types are known as Nishikigoi, or traditional koi. Nishiki means a gorgeous collection of colors and is commonly used in association with the colorful belt worn with a traditional kimono. Over time, the number of Nishikigoi classifications has ballooned to over 70 different types! Here is a great chart by the (apparently now-defunct) Forever-Mango.com, showing the various colors of Koi, and their classifications. For example, the butterfly koi, or dragon carp, is a cross between the traditional koi and a breed of Asian carp with long fins. With careful breeding, after several generations, the butterfly carp was developed, with its extra long flowing fins. That said, some consider this to not be a Nishikigoi, or traditional koi. Way over on the other side of Eurasia, in Austria, farmers bred a type of carp known as Mirror Carp, denoted due to the fact that their large, armor-like scales were so reflective they looked like little mirrors. When these fish were imported into Japan in the early 1900s and cross-bred with traditional colors of Japanese koi, wild new variations of the fish were created. In both Chinese and Japanese culture, the koi fish is revered for its strength, perseverance, and dedication. Both of these cultures have wonderful myths, legends, and symbols connected to the koi fish, which we discuss here. There are two common legends connected to koi in Chinese culture. By far the most famous (and fantastic) is the Dragon’s Gate Waterfall legend. There is a famous legend in Chinese mythology regarding koi fish. The legend says that long ago, there was a huge abundance of golden, shimmering koi fish traveling upstream in the Yellow River in China. They slowly swam upstream, pushing valiantly against the rushing flow of water, building strength and perseverance all the way. Their glittering scales made the Yellow River shine as if it was a river of gold. During their travels, they arrived a large waterfall, a huge impossible barrier far too high to traverse. This waterfall is located in Hunan province, and is known as the “Dragon’s Gate”. Most of the koi in the school turned back and gave up, letting the current take them back downstream to tranquility and safety. Some, however, remained, jumping out of the water, attempting to climb their way up the waterfall to continue their journey. Time and again, these koi tried to travel up the waterfall, fighting against the rushing tide of splashing water. They would jump up, swimming as hard as they could to reach the top of the waterfall, only to get pummeled back down into the depths. Evil spirits that prowled the area watched these koi fish try, over and over, to cross over the waterfall, mocking and laughing at them. They cheered each failure and found amusement in the ordeal these koi fish were attempting. For one hundred years, this small school of koi continued to try to swim up the waterfall but failed each time. Still, each attempt strengthened the fish a little bit. And a little bit more. And a little bit more. The demons continued to laugh at these hardy fish, knowing that they would never reach the top of the waterfall. Until. One day, one of the shimmering golden koi fish went down to the depths, built up as much speed as it could, and leaped out of the water. The koi swam as hard as it could, up, up, up the falls. Battered and beaten, it continued to swim up, ignoring the howls from the evil spirits and disregarding the rushing water. With one final thrust of its fins, the golden koi reached the top of the falls, and continued up the stream. The evil spirits were silenced by the sight of the koi’s success in accomplishing the impossible. The gods noticed the koi’s success, seeing the strength and dedication exemplified in the koi’s harrowing journey. The gods transformed the koi into a great golden dragon as a reward for its deeds. In Chinese culture, the golden dragon is the ultimate symbol of power and strength. The waterfall became known as the Dragon’s Gate due to this story. The ying-yang symbol is a famous Taoist symbol, universally known for the black and white swooshes swirling around each other. The two colors represent the balance of all things, and the connected harmony in everything. Over time, artists combined the yin-yang shape with the koi fish shape and created the now ubiquitous koi ying-yang design. In this design, the koi further cements the connectedness of all things and the flow of nature. In Japanese culture and myth, the koi fish is associated with a few different myths and legends. One of the most famous Japanese koi associations is between the koi fish and samurai warriors. These warriors were known for their bravery, strength, and dedication. 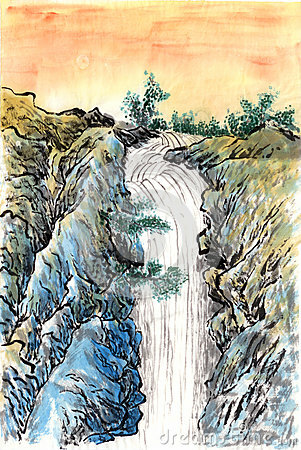 The koi fish leap up the falls, and swim with such dedication and determination that they were compared to the samurai. Additionally, it is said that if a koi fish is caught and brought out of the water, it will not wriggle and thrash, but rather, it will stay still, stoic and strong. Even as the fisherman’s knife descends, the koi will stay motionless, accepting its fate fearlessly — like the samurai. In Japanese Buddhist tradition, the koi are used to represent courage. According to history and legend in China, Confucius’ son was given an unusual carp by king Shoko of Ro, and he kept the fish for his viewing pleasure. The fish became the subject of many artworks and sculptures, and it became a symbol for prosperity. As there is a good deal of wild carp throughout China, their presence helped as a food source, and their strength became an inspiration. Koi fish are known to swim in pairs, and naturally became a symbol of love and affection. The fact that the koi tend to pair of became a symbol of matrimony, love, and amorous affection. Additionally, the fact that the carp often lays hundreds, if not thousands, of eggs each breeding season really pushes the whole love angle to a new level! In Japan, the Koi is a symbol of love and friendship, as well as bravery and strength. They are considered to be the warrior’s fish, and are very much a masculine symbol in Japanese culture. Each year, at the Japanese Boy’s Day Festival (May 5th), colorful windsock-like streamers of Koi fish are brought out to swim valiantly in the breeze in joyful bursts of color. These flags are called “Koinobori” and are flown in the hopes that the boys at the festival will grow up strong and healthy as the koi. In a feng shui aquarium, the usual number of koi fish present totals nine fish. The standard color classification for a Koi aquarium is to include eight colored fish of various pigments and one black koi. The black koi wards off bad luck, while the eight colored types bring various types of good luck, and symbolize positive traits. Throughout Chinese art, a common theme of nine koi fish is represented in the color palette described above. 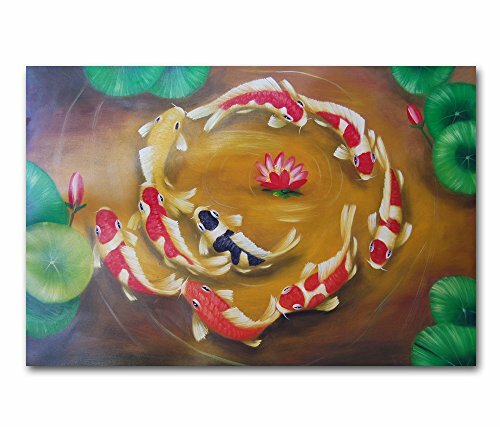 All of the koi colors have positive meanings associated with them, and all are considered beneficial in feng shui. The various colors have different meanings, with each one having a slightly different symbolism. Black koi fish are a masculine symbol, denoting fatherhood, strength, and perseverance. Red koi suggest the female, motherhood, and care. Additionally, these carp are symbols of strength as well. The presence of pink on a koi fish is symbolic of the female, specifically of daughters. Blue Koi Fish are a symbol of peace and tranquility. The shimmering blue represents calm, and to some degree childhood and the son. Golden koi fish symbolize wealth and prosperity, naturally! If you’re looking to get a raise, pick up a few golden koi fish! The koi fish is a common tattoo found throughout Asia, and throughout the world. Koi tattoos are often placed on the back or on the forearm, and the colors generally represent the details expressed above. The ying-yang koi symbol is also common and is often in black and white. As the koi is a sign of luck, auspiciousness, and plenty, it is an excellent choice for a positive symbol tattoo. Throughout the world, the meaning of the koi fish is a positive symbol of love, plenty, strength, bravery, and determination. All of these qualities are excellent sources of inspiration, and consequently, the image of the koi is frequently found in artworks, tattoos, and the like. But perhaps the most rewarding source of koi inspiration is a koi pond itself! If you want to keep some of these stunning, shimmering living jewels in your home, or in your yard, be sure to check out our guide to building an inexpensive koi pond, and our information on koi pond care.